Posted on May 3, 2018 at 5:41 am. We begin today with WOLF PACK PRIDE!! Thanks to all the students and staff who got into the spirit of Spirit Week and dressed-up in their favorite Sports Team attire. You’re looking good, Williamsburg sports fans! 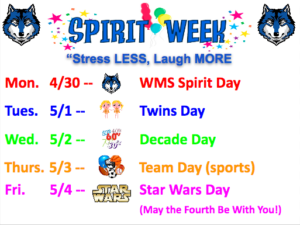 We wrap up our week-long Spirit Week celebration tomorrow — May the Fourth — with STAR WARS DAY at WMS. Jedis and aliens and Imperial Troops are all welcome — just be sure to leave your light sabers and blasters at home. So get into the school spirit, wolves, and BE A PART OF THE PRIDE!! And now as part of Spirit Week and our “Stress Less, Laugh More” initiative, we’d like to welcome a pair of special guests to the WOLF-TV Studio. Say “hello” to Ms. Bowler and Ms. Berree! BERREE: Hello, Wolf Pack!! I’m Ms. Berree, your school social worker. BOWLER: And I’m Ms. Bowler, your school substance abuse counselor. We’re representing the Student Services Staff with today’s Mindful Moment. BERREE: Many people — both kids AND adults — can struggle with anxiety. And oftentimes, these anxious feelings can strike without warning, for no apparent reason. One minute you could be feeling fine and having a great time — but then the next minute you’re feeling panicky, and maybe even sick! BOWLER: And to make matters worse, sometimes we feel too self-conscious or embarrassed to ask for help. So those anxious feelings go unchecked — and that can have a BIG impact on your mental health. BERREE: Well I’m here to tell you that anxiety is NOTHING to be embarrassed about — we ALL deal with it. And if you ever feel it happening to YOU, there are some easy ways to calm yourself without anyone even noticing. BOWLER: That’s right! We can even do one together — right now. We’re just going to give you a few simple instructions, and I encourage you to give it a try. Here we go: Everyone get REALLY quiet, stop talking, stop moving, just be still. Either close your eyes gently, or keep them open — either way if fine. BERREE: Now, focus on a sound in the background – one that doesn’t go away. Focus on that sound, and just listen. Keep listening to that sound, block out everything else, for just a moment. Listen. BOWLER: Good… now bring your attention back to us. Back to the present. Open your eyes, take a deep breath. Stress LESS, and Laugh MORE. BERREE: We hope you all feel a bit more relaxed as you start your day. Have a great week, Williamsburg, and Be a Part of the Pride!! Thanks for that Mindful Moment, Ms. Bowler and Ms. Berree. I feel more relaxed already! Wolf Pack Pride continues with some GREAT news from the WMS music department. Last Friday’s “Musicale Competition” in Busch Gardens was a huge success — and our musical students took home a slew of awards. The 6th grade Orchestra, Concert Orchestra, Advanced Choir, and 6th grade Concert Band ALL won 1st place in their divisions. And the Symphonic Band took 3rd. But that’s not all. Both the 6th grade Concert Choir AND the Wind Ensemble won the biggest awards of the day. Not only did they win 1st place in their divisions, but BOTH were awarded the GRAND CHAMPION TROPHY — awarded to the highest scoring choir and band at the competition!! The WMS Spring Musical — Beauty and the Beast, Jr. — is ready to “raise the curtain”. And this is a show you WON’T want to miss. Check it out! And now for an important announcement for all TAB Book Club members. TODAY is your last chance to sign-up for next week’s Skype with award winning author Stuart Gibbs. So bring your completed permission slip to the library ASAP! See Ms. Lord with any questions. Sister Circle has been RESCHEDULED for next THURSDAY — May 10th in room 233 during ASP 1. It’s the final meeting of the year, and you don’t want to miss the celebration. See Ms. Cameron with any questions.